A lot has already been written about Thalerhof, near Graz, and other concentration camps from the days of World War I. When the Austro-Hungarian armies, with the assistance of Germany, again drove the Russians back across the Zbruch River, an unprecedented terror towards the so called "Russophiles" was unleashed, in retaliation for "Russophiles" purported contrivance to the earlier losses of the Austrian army. The Austrian authorities declared, that they would pay 300 Austrian crowns for every "spy" that was turned in. Those eager to make some money were found, and because of them many innocent people perished. Victims were hung from scaffolds erected in densely populated areas, or from trees along the roads. Austrians, Hungarians, Poles, and Jews, did not take the time to differentiate between "Russian", "Rus", or "Rusyn" (Ruthenian). However, some of our own people also contributed to this tragedy. There were cases, where in areas, entirely populated by Poles, brother would be turned in by brother for those 300 crowns. It was sufficient for the provocator to point a finger at the "Russian spy", for that human being's fate to be decided. 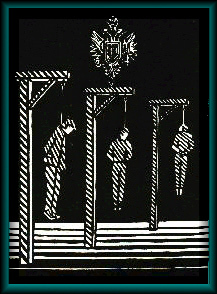 The verdict was pronounced by the Austrian petty officer: the first to be hung, and the second to be issued the "Judas" payment. During the initial phase of the war, the Parliament did not function in Vienna for two years. When the young emperor Karl convened the Parliament, the truth about the tyranny of the Austro-Hungarian military became generally well-known. This is just one hellish example of emperial terror, though history shows, that all the other dictatorships around the world behaved no better. For centuries the fate of Lemkos was settled within the framework of other empires. In many Lemko villages, during the period between the two World Wars, memorial crosses were erected to commemorate the victims of Thalerhof. Today a "Thalerhof" cross can be seen at Theodor Goch's museum in Zyndranova, which he found amidst the ruins of Lemkivshchyna. * Editor's Note: As a matter of fact, at the beginning of WW I the leaders of the Moscophile party created in Kyiv "The Supportive Committee of the Russian Army". This committee released a special brochure-guidebook, stamped "Secret. Exclusively for Officers of the Russian Army" which was entitled "Modern Galicia. Its Political and Economic Outlook" with addresses of Moscophile organizations and leaders, on whom the Russian Army could rely. One of these brochures fell into the hands of the Austrian police (apparently from a captured officer) and this in turn led to mass repressions. From Eastern Galicia over 5,000 persons were shipped to Thalerhof, and from Lemkivshchyna about 3,000.